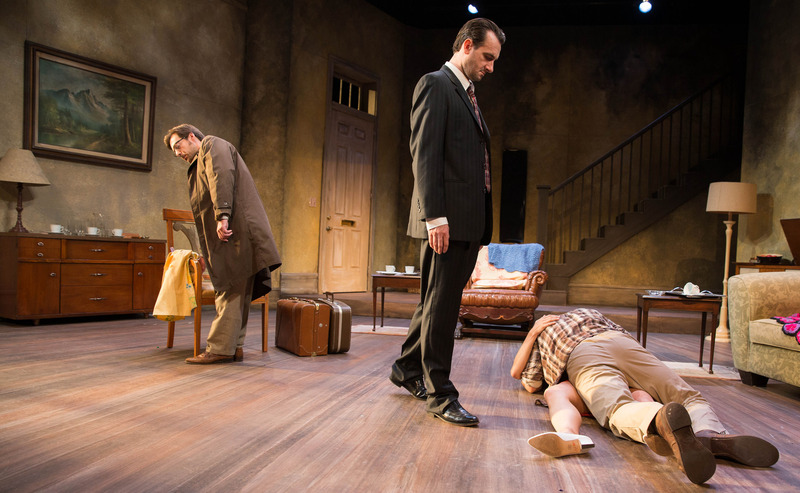 Before we had THE TEXAS CHAINSAW MASSACRE to ponder the consequences of disturbing a closed-in, non-traditional family’s routine, there was Harold Pinter’s THE HOMECOMING. Both stories feature plenty of hair-raising recreational activities that hapless interlopers are subjected to. In both, the blood – literal or metaphysical – runs freely. If some sadistic reality TV show offered the chance to pick one of the two worlds to parachute back into, with a large monetary prize for escaping alive, I’m not sure which I would select. Wait – I do know. I would take Texas over North London any day. At least in the Texas storyline you can periodically run screaming around outside in the yard, temporarily deluding yourself that all is going to turn out ok. 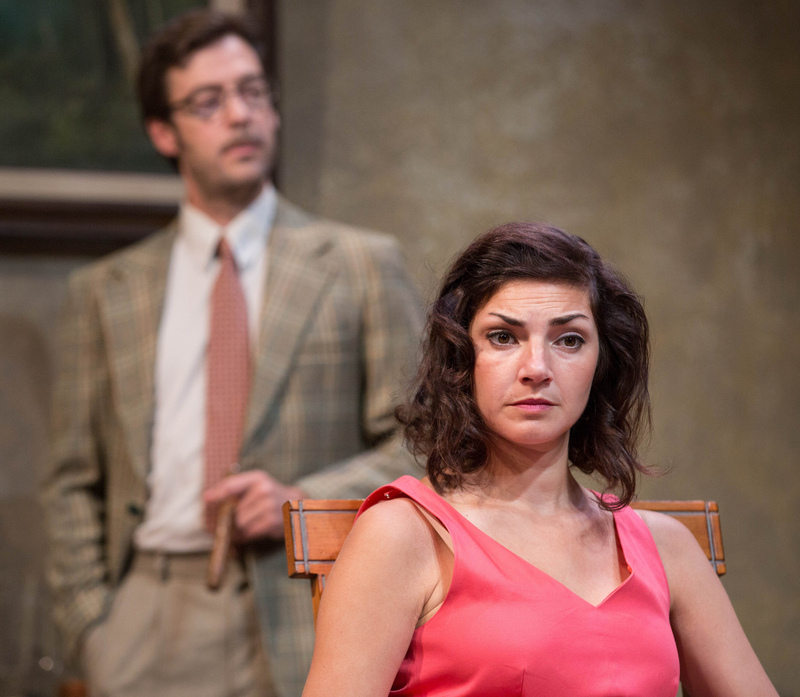 But in Pinter’s nightmare indoors tale, now getting a fairly strong production at the classic old Portland Imago Theatre in Southeast, never for a moment does it look like things are gong to turn out well for our visitors. True, in Pinter’s world no one ends up on a hook. But in some ways THE HOMECOMING is the scarier of the two because it is harder to understand what is wrong in this sick world and what could possibly fix it. THE HOMECOMING is specific to time and place. It could only have been written in the early 1960’s in the UK. Tapping in to the trickle (soon to turn torrent) of angry (young) white men started by John Osbourne’s LOOK BACK IN ANGER (1956) and Tom Murphy’s A WHISTLE IN THE DARK (1961), THE HOMECOMING channels an inarticulate sexual and emotional rage among lower middle class English men (or Irish men, in Murphy’s case). This genre has basically blossomed and covered the globe ever since, with practitioners like Mamet, McPherson, Scorsese and Tarantino all paying tribute (consciously or not) to Pinter. It is a mystery of history (or perhaps marketing) that THE HOMECOMING is recalled as ground zero for this type of play, when really it was Irish exile Tom Murphy’s A WHISTLE IN THE DARK that was the more original and better work four years before Pinter’s. If you don’t know Murphy’s savage story of a lost Irish immigrant family of father and sons in London, fighting other Irish gangs to the death, once you see it you’ll think less of THE HOMECOMING – not because THE HOMECOMING is in any way deficient, but only because Murphy did it first. WHISTLE, which has deep Irish social context, is almost never performed anymore, but it was included in Druid’s epic 2012 DruidMurphy cycle in Galway. The experience of seeing it there was evidence enough that WHISTLE is one of the great unknown works of the 20th century. By contrast, THE HOMECOMING is quite a bit better known. There will be blood. 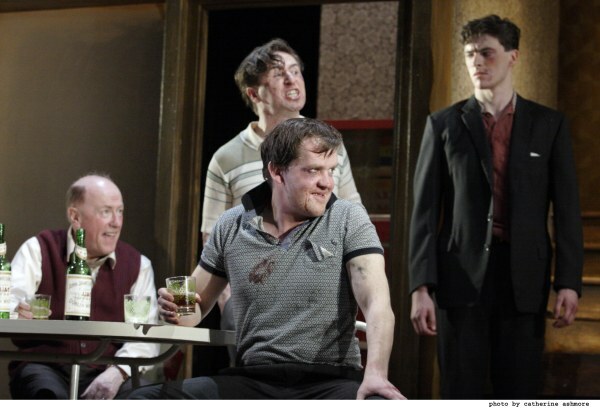 Angry white (Irish) men in the 2012 Druid production of Tom Murphy’s little known A WHISTLE IN THE DARK, which preceded THE HOMECOMING. I read THE HOMECOMING as on the very early edge of a post colonial, post empire United Kingdom where all the old racial, gender and class certainties were poised to blow sky high. Appearances are still more or less propped up – meaning the family still has a house, the men still wear ties. No one is homeless yet. But clearly that is the kind of future that awaits guys like Joey. If the play had been set a decade later, Joey and possibly Lenny would have been down the King’s Road sticking safety pins through their cheeks, knocking back hard cider while The Clash annihilated their hearing. There are no non-whites in THE HOMECOMING, but you can only imagine what would happen if a knock on the door revealed a South Asian or African face (a moment that happens in another London play that descends from the Murphy and Pinter strand, Irish playwright Enda Walsh’s THE WALWORTH FARCE). The rage of under-utilized, emotionally closed off whites is central to Pinter’s work, even if as a subject it’s perhaps not quite substantial enough to merit a lifetime’s output. The colonial implications of the play are also manifested in the move of Teddy and Ruth to the sunny skies of America – and their return for a visit to the old country. Don’t mind Joey. Jeffrey Jason Gilpin, Jacob Coleman, Anne Sorce, Jim Vadala. Photo: John Rudoff. Though he could not have known it at the time, in this play Pinter presciently foreshadowed what was to become a pretty dark chapter in the UK (and world) for the next few decades. It’s a straight line from a lot of the family and social tensions on display in this hermetically sealed drawing room to the rise of the National Front in 1970’s Britain, rioting in the streets, and the popularity of the British National Party, which was dramatized in David Edgar’s DESTINY (1976). And then along came the Iron Lady to clean things up. All this is to say, THE HOMECOMING derives from a precise moment in history, and the fact that we are now so far beyond that era can at times render the play like a black and white photo. It’s interesting to see the way we were. But it’s not particularly attractive. In some ways, it’s stuff we’d rather forget. And many contemporary viewers – particularly women – may struggle to find something to enjoy or learn here. Imago’s production has some strong actors on board. Douglas Mitchell is an irate and spluttering Max, struggling to understand why his sons don’t respect him. Jacob Coleman as Lenny is all quiet restraint and slick hair, though you know there’s limitless violence just below the surface. Craig Rovere as Uncle Sam seems a little too effeminate to belong to this group of marauders – or if that’s really who the character is, there would have been more text directly addressing this aspect of him, which would have been highly noteworthy at the time. Jim Vadala is a frozen, almost brain dead Joey, a brawny lad a few cards short of a deck. And Jeffrey Jason Gilpin, mustache and all, is brilliant as the mild-mannered professional who has tried to leave the family behind and make off to (where else) America with his wife. I’m in charge here. Anne Sorce is Ruth. Photo: John Rudoff. But as in any production of THE HOMECOMING, Ruth makes or breaks it. And director Jerry Mouawad has found the perfect actor to play this role in a stunning Anne Sorce. Sorce is regal and entrancing as the cool-tempered queen of this mad men’s realm. She talks and moves in a slow, droning style that heightens the brittle insanity around her. And as things fall apart, she just goes along to get along. If the boys have subterranean violence to broadcast her way, this Ruth is more than up to the task of returning fire. And one by one she reduces each man to a stuttering, quivering mess. From our vantage point today, with women in command on many sides, visiting this slice of old London where women’s lot was basically to get married, keep house and fend off sexual propositions, a shiver goes down your spine at how horribly confining that world was (and still is when it pops up). But empires do not fall without a fight. And before London could become the sensational multi cultural world capital it is today, there was going to be a lot of bloodshed and violence as the old world went under. Pinter takes a chainsaw to everything that was poised for destruction in early 1960’s London, and 50 years on it’s remarkable how forceful and horrifying THE HOMECOMING still is. See all Imago photos of THE HOMECOMING.